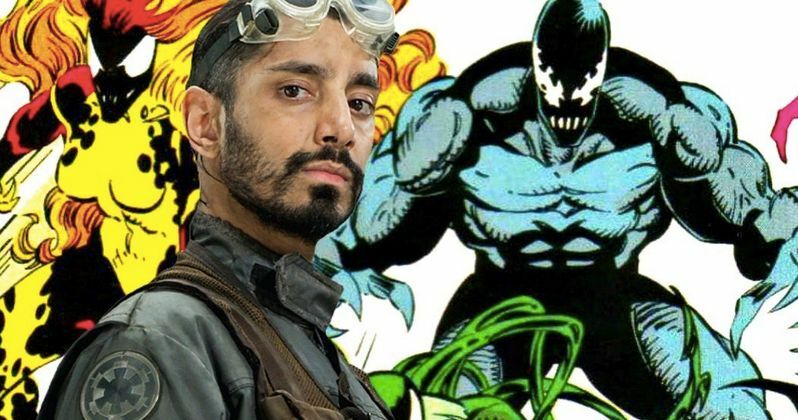 Ruben Fleischer revealed that Riz Ahmed is playing Riot in Venom, in addition to Dr. Carlton Drake. The director made the announcement at San Diego Comic-Con after showing off some brand-new footage at Hall H on Friday evening. Riot is a symbiote that has the unique ability to switch from host to host, which means that "You don't know where Riot is going to turn up," says Fleischer. This has definitely thrown a curve ball for many fans who felt like that they had already figured out the storyline for the upcoming film. Venom is the origin story for the character with Tom Hardy starring as Eddie Brock, who later merges with the symbiote. Brock is a reporter and becomes exposed to the symbiote while investigating the Life Foundation. Riz Ahmed's Dr. Carlton Drake works at the shady Life Foundation and conducts experiments on the symbiote after it lands on Earth, which leads to him becoming one of Riot's hosts in the film. The Venom Comic-Con footage featured two symbiotes fighting, which Ruben Fleischer later confirmed to be Riot during the panel. When Riz Ahmed was first cast in Venom, it was believed that he was playing Carnage, but that was later shot down when the character information was made public, where it was revealed that he was actually portraying Dr. Carlton Drake. However, Ruben Fleischer was asked about Carnage during the Comic-Con panel, and while he wouldn't confirm that Carnage was a sure bet, he did say, "There may be other villains in Venom. But we don't want to give it away." There have been reports that Woody Harrelson is playing Carnage in Venom, with the actor confirming a mystery role that only has a small part, but will have a much larger part in the sequel. Having Riot turn up in Venom makes a lot of sense. The character made its first appearance in the Lethal Protector series, which is what Ruben Fleisher's film is partly based on. Riot is one of the five symbiotes that are created in the lab, who are also called the "children" of Venom. As previously noted, Riot can move around to different hosts, and Fleischer makes it seem like that power will be a big part of the movie. Could Riot inhabit someone who Eddie Brock loves and trusts? Sony's Venom received a big kick in excitement after the San Diego Comic-Con panel with the new footage. Unfortunately, that footage has yet to find its way online, which means that it more than likely will not. But, the film opens on October 5th, which is just right around the corner. Tom Hardy was also on hand at the panel and joked that he would like to go toe-to-toe with Spider-Man: Far From Home star Tom Holland, which according to Ruben Fleischer, could actually happen down the line. While we wait for some more news about Venom, you can check out the latest trailer that was released a few weeks ago below, thanks to the Sony Pictures YouTube channel.